Analysis: Collins crashed his car into a tree Friday morning and was waived by the Ravens later that day. Regardless of how things play out from a legal perspective, he likely will receive some form of punishment from the NFL. Analysis: Collins was arrested Friday morning after his car crashed into a tree about a mile away from team headquarters. He previously was scheduled to become a restricted free agent, with no assurance of receiving a tender even before Friday's incident. The 24-year-old will be an unrestricted free agent if he passes through waivers unclaimed. Analysis: Ravens spokesman Chad Steele said the team has spoken to the police and is aware of the situation. Collins is scheduled to become a restricted free agent this offseason, and there had already been speculation about the Ravens non-tendering him. Charges against Collins may be announced Friday afternoon. Updating a previous report, Collins (foot), who is listed as questionable for Sunday's game against the Falcons, was a full participant in Friday's practice. Collins (foot) is listed as questionable for Sunday's game against the Falcons. Collins (foot) wasn't spotted on the field during the media-access portion of Friday's practice, Jeff Zrebiec of The Athletic reports. Analysis: Collins was able to get some limited work in at Thursday's practice, but it appears he will sandwich "DNP" listings around that. That's hardly encouraging with regards to his availability for Week 13 against the Falcons, but the Ravens will provide official word on his status shortly after Friday's practice concludes. If Collins is held out for the second straight game, it would clear the way for Gus Edwards to once again serve as the Ravens' unquestioned top back. Collins (foot) was listed as a limited practice participant Thursday. 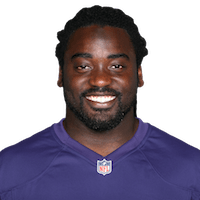 Analysis: So was Gus Edwards (ankle) and with both trending toward Week 13 active status, Collins' projected workload in the Ravens backfield Sunday against the Falcons is hampered by the emergence of Edwards over the team's last two outings. Collins (foot) returned to practice Thursday, Jeff Zrebiec of The Athletic reports. Analysis: The same applies to fellow running back Gus Edwards (ankle), though it remains to be seen how the Ravens list the duo's participation level. While Collins seems to have a solid shot to play Sunday against the Falcons, his role in the Baltimore offense has been clouded by the recent emergence of Edwards. Collins (foot) didn't practice Wednesday, Jeff Zrebiec of The Athletic reports. Analysis: An earlier report from Zrebiec indicated that Collins -- who was inactive for the Week 12 win over the Raiders -- is viewed as day-to-day in advance of Sunday's game against the Falcons. While Collins' absence from practice Wednesday comes as no surprise, it's worth noting that fellow running back Gus Edwards also sat out the session, though it's possible that Edwards was simply being rested. Coach John Harbaugh said Collins (foot) was unlikely to participate in practice Wednesday and is viewed as day-to-day ahead of Sunday's game against the Falcons, Jeff Zrebiec of The Athletic reports. Coach John Harbaugh downplayed the severity of Collins' foot injury when he addressed the matter Monday, Jamison Hensley of ESPN.com reports. Collins (foot) is inactive for Sunday's game against the Raiders. 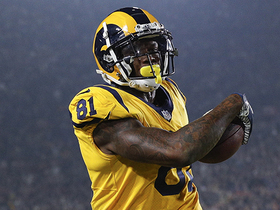 Collins (foot) will not play Sunday against Oakland, Ian Rapoport of NFL Network reports. Analysis: The foot injury sidelined Collins for the Ravens' second practice of Week 12, but he progressed to full participation Friday, so this is a surprise. The Ravens will likely lean heavily on Gus Edwards again with Collins out. 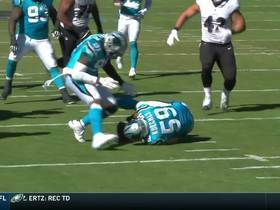 Collins (foot), who is listed as questionable for Sunday's game against the Raiders, is expected to suit up, a source told Ian Rapoport of NFL Network. Despite returning to practice Friday as a full participant, Collins (foot) is listed as questionable for Sunday's game against the Raiders, Jamison Hensley of ESPN.com reports. Collins (foot) took part in Friday's practice, Jamison Hensley of ESPN.com reports. Analysis: It won't be clear until after practice how much work Collins was able to get in, but it's a good sign that he was on the field after sitting out the previous day due to his foot injury. His status for Week 12 will be revealed when the Ravens release their final injury report of the week after practice concludes. Collins (foot) didn't practice Thursday, Jeff Zrebiec of The Athletic reports. Analysis: The running back wasn't listed on Wednesday's injury report, so it remains to be seen if his absence Thursday was maintenance-related or indicative of a setback. Collins' status for Sunday's game against the Raiders is especially notable for those now invested in fellow running back Gus Edwards, following his break-out effort this past weekend. Collins ran for 18 yards and a touchdown on seven carries during Sunday's 24-21 win over the Bengals. Collins (foot) rushed nine times for 35 yards and a touchdown while catching his lone target for four yards in Sunday's 23-16 loss to the Steelers. Analysis: Collins easily found paydirt from one yard out in the third quarter for his team's lone touchdown. While he's seen 11 or fewer carries in each of the past three weeks, Collins has been Baltimore's primary weapon near the goal line with six rushing touchdowns and one receiving score heading into the team's Week 10 bye. Collins (foot) is active for Sunday's game against the Steelers, Jamison Hensley of ESPN.com reports. Analysis: Despite carrying a questionable tag into the weekend, Collins' status never seemed to be in much peril after he put in a full practice Friday. The Ravens' decision to keep the newly acquired Ty Montgomery inactive for Week 9 shows at least some level of confidence in Collins' health, so expect the 24-year-old to maintain his usual role as the team's lead runner. Javorius Allen should handle the bulk of the passing-down work, while No. 3 option Gus Edwards will likely only see light work. Collins (foot), who is listed as questionable for Sunday's game against the Steelers, is expected to play, Ian Rapoport of NFL Network reports. Collins (foot) is listed as questionable for Sunday's game against the Steelers after being listed as a full practice participant Friday. Analysis: It won't be clear until after practice how much work Collins was able to put in, but he was spotted running "without favoring either foot" during the media-access portion, so he's seemingly feeling good. The Ravens will reveal Collins' status for Sunday's matchup with the Steelers when they release their final injury report of the week after practice comes to a close. Collins (foot) didn't practice Thursday, Jamison Hensley of ESPN.com reports. Analysis: The downgrade in participation is concerning after Collins was involved in a limited capacity Wednesday. What Collins is able to do at practice Friday will be telling with regard to his status for Sunday's game against the Steelers. Javorius Allen, Gus Edwards and newcomer Ty Montgomery round out the Ravens' backfield options behind Collins. Collins was limited at practice Wednesday due to a foot injury. Analysis: Assuming the issue isn't a major concern, Collins should be in line to head the Baltimore backfield Sunday against Pittsburgh, with newcomer Ty Montgomery probably more of a threat to Javorius Allen's workload. Collins has logged 11 carries in both of his last two games and maxed out at 68 rushing yards in Week 3, but he does at least offer a serviceable fantasy floor with three touchdowns over his last three contests and double-digit carry counts in each of his last six outings. Collins rushed 11 times for 49 yards and a touchdown while catching both of his targets for 14 yards in Sunday's 36-21 loss to Carolina. He also lost a fumble. Collins rushed for 38 yards on 11 carries and added 10 yards on three catches during Sunday's 24-23 loss to the Saints. Collins rushed 19 times for 54 yards and two touchdowns in Sunday's 21-0 win over the Titans. Analysis: Collins saw a season high in carries but averaged just 2.8 YPC and salvaged his day by finding the end zone twice. The 23-year-old has not yet topped 68 rushing yards in a game this season despite seeing at least 11 rushes in each of his last four contests. He was also shut out of the passing game for the first time all year and will look to be more involved Week 7 against New Orleans. Collins rushed 12 times for 59 yards and caught one of four targets for seven yards in Sunday's 12-9 overtime loss to the Browns. Analysis: Collins is Baltimore's most effective option on the ground, but his ineptitude in the passing game keeps Javorius Allen heavily involved as well. 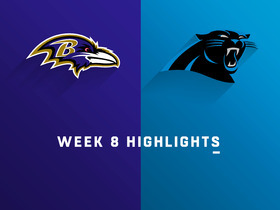 The bruising runner is the Ravens' best bet for touchdowns when he's not battling fumbling issues, but the team was kept out of the end zone for 70 minutes in this one. Up next for Collins is a Week 6 trip to Tennessee. Collins (knee) returned to practice Friday as a full participant, with coach John Harbaugh saying afterward that the running back will play in Sunday's game at Cleveland, Jeff Zrebiec of The Athletic reports. Collins (knee) took part in Friday's practice, Jamison Hensley of ESPN.com reports. Analysis: Hensley relays that Collins "didn't appear to be at full strength," but it's encouraging that the running back was able to get back on the field after sitting out Thursday. Collins' status for the Week 5 matchup with the Browns will be revealed after Friday's practice concludes. Collins' (knee) absence from practice Thursday was portrayed as precautionary, according toTom Pelissero of NFL.com. Analysis: Moreover, the report suggests that the Ravens "want (Collins) ready to rip" Sunday against the Browns. We'll circle back on Collins' status Friday, but as long as he practices in some capacity, his Week 5 playing prospects will brighten. Collins (knee) did not practice Thursday, Jeff Zrebiec of The Athletic reports. Analysis: Collins was limited Wednesday, so the downgrade in participation Thursday is notable. What the running back is able to do Friday at practice will thus be telling with regard to his Week 5 status. Next up for snaps in the Baltimore backfield if Collins is limited (or out) Sunday against the Browns are Javorius Allen and De'Lance Turner. Collins (knee) was limited at practice Wednesday. Collins rushed 11 times for 42 yards with one lost fumble during Sunday's 26-14 victory over the Steelers. He also secured one of three targets for a three-yard touchdown. Collins rushed for 68 yards and a touchdown during Sunday's 27-14 win over Denver. He added six yards on three catches. Collins (illness) was a full participant in Thursday's practice. Collins (illness) returned to practice Thursday, Jamison Hensley of ESPN.com reports. 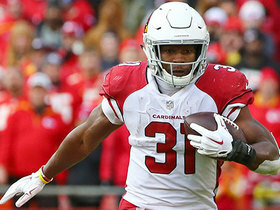 Analysis: The running back missed Wednesday's session, but his return to the field Thursday puts him on track to play Sunday against the Broncos. Collins has ceded touches to Javorius Allen early on, but we'd expect his carry volume to improve in the coming weeks, notably when game flows favor a run-heavy attack. Collins missed Wednesday's practice while recovering from an illness, Jamison Hensley of ESPN.com reports. Collins isn't practicing Wednesday due to an unspecified issue, Jeff Zrebiec of The Athletic reports. Collins rushed nine times for 35 yards and secured three of four targets for 55 yards in the Ravens' 34-23 loss to the Bengals on Thursday. Kenneth Dixon's knee injury isn't expected to have a dramatic affect on Collins' role in the Baltimore offense, Jeff Zrebiec of The Athletic reports. Collins rushed for 13 yards and a touchdown on seven carries and added a six-yard reception during Sunday's 47-3 win over Buffalo. He lost a fumble during the contest. Analysis: Collins dragged a bunch of Bills across the goal line for a first-quarter touchdown on Sunday. Collins was hardly dominant on Sunday, but it's also hard to judge a back on a game like Sunday's in which his team took a commanding lead fairly early on. All of Baltimore's backs got into the action. Collins has taken three carries for 33 yards this preseason. Collins isn't in uniform for Thursday's Hall of Fame Game against the Bears, freelance NFL writer Jeff Zrebiec reports. Analysis: Javorius Allen and Kenneth Dixon (hamstring) are in the same boat, leaving the backfield to UDFAs Gus Edwards, Mark Thompson and De'Lance Turner. Once the first-team offense gets extended run during the preseason, expect Collins to handle most of the early-down work, with Allen and potentially Dixon earning reps as pass catchers. 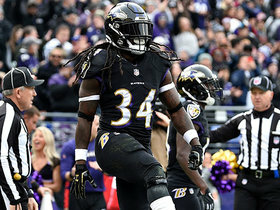 Collins enters spring workouts as the clear lead runner in Baltimore after the Ravens opted against using any of their draft picks on running backs, ESPN.com's Jamison Hensley reports. Collins has signed his exclusive-rights free-agent tender with the Ravens, The Baltimore Sun reports. Collins has been tendered by the Ravens as an exclusive rights free agent, Jamison Hensley of ESPN.com reports. Ravens head coach John Harbaugh praised Collins for his performance during the 2017 season, but stopped short of naming the running back the team's starter heading into 2018, Jeff Zrebiec of The Baltimore Sun reports. "I'm looking to upgrade everything. We're going to look to have the best running-back group we can," Harbaugh said Thursday. Collins rushed 20 times for 78 yards and a touchdown and caught two passes for 18 yards in Sunday's 31-27 loss to the Bengals. Analysis: The 78 rushing yards are Collins' highest total since Week 14 and the 20 carries tied his season high. The 23-year-old's 17-yard touchdown run in the third quarter was the Ravens' answer to a Bengals defensive touchdown, at the time keeping Baltimore's playoff hopes alive. The loss eliminated the Ravens regardless, but Collins bursting onto the scene to earn the role of the team's feature back this season is one of the better stories of the 2017 season. Collins rushed for 51 yards on 18 carries and added 15 yards on three catches during Saturday's 23-16 win over the Colts. He fumbled during the contest. Ravens head coach John Harbaugh said Collins made it out of Sunday's 27-10 win over the Browns without any health concerns, Jeff Zrebiec of The Baltimore Sun reports. Collins gained 19 yards on 12 carries and 33 yards on five receptions (eight targets) in Sunday's 27-10 win over the Browns. Collins (migraines) is not listed on the Ravens' injury report Wednesday. Analysis: According to Jeff Zrebiec of the Baltimore Sun, Collins' issues with migraines are long-standing. 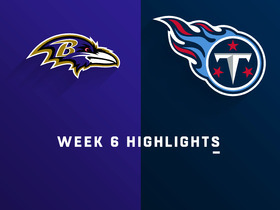 However, the second-year back has appeared in 12 straight games and doesn't appear to be in danger of missing Baltimore's upcoming clash with Cleveland. Zrebiec adds that measures such as Collins' dark visor have helped keep the symptoms at bay. As it stands, Collins remains on track to play in Week 15, where he'll have a chance to extend his touchdown streak to five games. Collins rushed 18 times for 120 yards and one touchdown while securing both of his targets for another 46 yards during Sunday's 39-38 loss to Pittsburgh. Collins (migraines) isn't listed on Wednesday's injury report. Ravens head coach John Harbaugh confirmed Monday that Collins was bothered by migraines during Sunday's 44-20 win over the Lions, Jamison Hensley of ESPN.com reports. "I can tell you this, migraines are very real," Harbaugh said. "They're tough." Collins carried 15 times for 75 yards and a pair of touchdowns during Sunday's 44-20 win over the Lions. He also caught both targets for an additional 23 yards. Collins (calf) is active for Sunday's matchup against the Lions. Collins (calf) is expected to play Sunday against Detroit, Adam Schefter of ESPN reports. Analysis: Collins was held out of Wednesday's practice following the Ravens' Monday night win over the Texans, but his ability to log full sessions Thursday and Friday suggests he's not in much danger of missing the Week 13 contest. Collins (calf) is listed as questionable for Sunday's game against the Lions. Collins (calf) put in a full practice Thursday. Analysis: The full session clears the way for Collins to suit up Sunday against the Lions in Baltimore, where he'll presumably be in line for the start and the bulk of the carries out of the backfield. Despite his standing atop the depth chart, Collins shouldn't be expected to dominate the snaps by an overwhelming margin, as the recent return of Danny Woodhead from injured reserve offers head coach John Harbaugh another pass-catching option to keep involved in the offense. Collins (calf) was spotted at Thursday's practice, Edward Lee of The Baltimore Sun reports. Analysis: We'll have to see how the Ravens portray Collins' level of participation, but the running back's return to the field Thursday, in any capacity, bodes well for his chances of suiting up Sunday against the Lions. Collins was held out during Wednesday's practice with a calf issue. Collins isn't present for Wednesday's team walk-through practice, Jeff Zrebiec of The Baltimore Sun reports. Analysis: Collins may have suffered an injury in Monday's 23-16 win over Houston, despite finishing the night with 18 touches and playing through the end of the fourth quarter. An absence for the Week 13 game against Detroit would free up work for some combination of Javorius Allen and Terrance West alongside passing-down back Danny Woodhead. Collins rushed 16 times for 60 yards and a touchdown in Monday night's 23-16 win over the Texans. Collins had 20 carries for 49 yards and a touchdown, adding four catches for 22 yards on seven targets in Sunday's 23-0 win over the Packers. Offensive coordinator Marty Mornhinweg relayed that Collins will remain the Ravens' lead back even when Terrance West and Danny Woodhead return to the team's backfield mix, Jeff Zrebiec of The Baltimore Sun reports. Collins rushed 13 times for 43 yards and added a three-yard catch on his lone target in Sunday's 23-20 loss to Tennessee. Analysis: Collins couldn't get much going, losing playing time to receiving back Javorius Allen as their team trailed for the entirety of the final three quarters. Both running backs ended up with 14 touches, but it was Allen who was able to find pay dirt on a three-yard catch in the fourth quarter. While Collins is averaging a robust 5.6 yards per carry, none of his 93 rushing attempts have resulted in touchdowns. 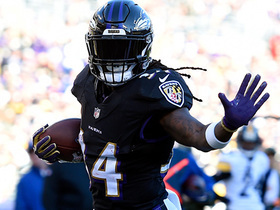 Baltimore Ravens running backs Alex Collins and Gus Edwards both score in Week 11. Take a look at NFL Network's Michael Fabiano's top five running back matchups heading into Week 11. 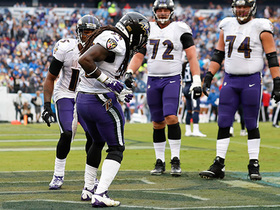 Baltimore Ravens running back Alex Collins bounces around the Tennessee Titans defense for a touchdown.